When I was a kid this card was my favorite of the few that featured action shots. The moment seemed spectacular, kinetic, dramatic, Meoli proclaiming with the spread of his arms “behold,” his head thrown back in awe. It was years before I realized that all I was looking at was some guy who’d just hit an infield popup. 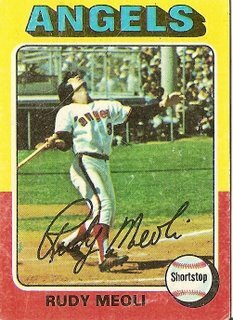 Even to this day there’s some residual effect of my inability to interpret the blatantly obvious in this picture: I still on some level think of Rudy Meoli, a backup infielder with a .212 lifetime average and more career errors than extra-base hits, as one of the most thrilling performers of his era. You are currently browsing the archives for the Rudy Meoli category.